In 1856, Freemasonry was introduced to the Philippines when a Spanish naval officer organized a lodge in Cavite under the auspices of the Portuguese Gran Oriente Lusitano. Soon, other Lodges under the jurisdictions of the British, Germans but more particularly under the Grand Orients of Spain gained their footholds thus making the Philippines a melting pot of plural jurisdictions. Masonry therefore has existed in the country for more than 159 years. However, native Filipinos, generally referred to as Indios were not allowed membership in the early decades of Masonry in the country. What may be considered the roots of true Philippine Masonry sprouted in 1889 when Logia Revolución was organized by Filipino nationalist Graciano Lopez-Jaena in Barcelona, Spain under the auspices of the Grande Oriente Español. This was in an era when Filipinos who went to Spain either to escape persecution or as students were advocating social and political reforms for the Philippines. Foremost among this group were Graciano Lopez-Jaena, Jose Rizal, Mariano Ponce, Galicano Apacible, Jose Ma Panganiban, Antonio Luna and Marcelo del Pilar. Lopez-Jaena was the first editor of the fortnightly La Solidaridad, the mouthpiece of the Propaganda Movement. He was initiated in 1882 at Logia Porvenir No. 2, and later served as its Worshipful Master. He became the Master of Logia Revolución, with Mariano Ponce as Secretary. Marcelo del Pilar was also member of this lodge. It was here where Ariston Bautista, Galicano Apacible, Jose Alejandrino and many other Filipinos were initiated. The founding by Filipino Masons of Logia Revolución in Spain was the first concrete step towards the formation of true Philippine Masonry. 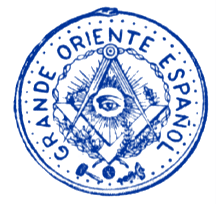 Lopez Jaena, with Marcelo del Pilar and other Filipino Masons organized a second lodge in Madrid, Logia Solidaridad No 53, chartered on May 15, 1890 also under the Grande Oriente Español . This lodge was actually, the revived Logia Solidaridad first founded in Barcelona by a mixed group of two Filipinos, Rafael del Pan and Ricardo Ayllon; three Cubans, a Puerto Rican and two peninsular Spaniards in 1886 but was dissolved in 1887. Upon its revival one of its original members, Julio Llorente became its Worshipful Master and Marcelo del Pilar its Senior Warden. When Logia Revolución was dissolved, this lodge became the lodge for Filipino expatriates in Spain. Marcelo del Pilar succeeded Llorente in January 1891. With the idea of propagating the teachings of Masonry, at the same time providing a unifying force for the Filipino society, Marcelo del Pilar sought authority from Grand Master Miguel Morayta, to establish Filipino Lodges in the Philippines. Morayta, the Grand Master of the Grande Oriente Español, was a professor at the Central University of Madrid. A republican and a liberal, he was the strongest ally of the Filipinos and the venerable President of the Hispano-Filipino Association. Antonio Luna and Pedro Serrano Lawtaw were commissioned to return to the country and organize Filipino lodges. But Antonio Luna had to go to France and Laktaw returned to the Philippines alone. Luna on the other hand, together with Dr. Trinidad Pardo de Tavera and Dr. Ariston Bautista founded a Masonic club or triangulo in Paris under the auspices of La Solidaridad No 53. Juan Luna, Felix Pardo de Tavera, Osmundo Evangelista and several others were initiated here. Pedro Serrano Laktaw, with the help of Moises Salvador (initiated in Madrid) and Jose A. Ramos (initiated in London), organized Logia Nilad. Ramos was its first Master, Salvador its Senior Warden and Serrano Laktaw, Secretary. It was constituted on January 6, 1892 and duly approved by the Grande Oriente Español as Logia Nilad No 144 on March 20, 1892. In July 1892, after his return to the Philippines, Jose Rizal was appointed as an Honorary Worshipful Master of the Lodge. Being the first Filipino Lodge from which others were organized, it was called Mother Lodge. By special authority of the Grande Oriente Español it exercised certain supervisory powers over all other lodges, and was also known as Logia Central y Delegada. A year later over 100 new members were added to its original founders. Logia Balagtas No 149 was next organized also in March 1892 in Sampaloc, Manila by Moises Salvador, Arcadio del Rosario, Numeriano Adriano, Bartolome Paez and Bonifacio Arevalo. Apolinario Mabini, Doroteo Cortez and several other patriots were initiated in this lodge. Filipino Lodges created an impact among its members. Soon these members started forming Masonic Triangulos scattered in Luzon, Visayas and Mindanao. More than 80 Triangulos were recorded organized in Manila, Central and Southern Luzon, Negros, Cebu, Capiz, Davao and Zamboanga. From here were established Lodges Labong No. 153 in Malabon by Pedro Camus; Masala No. 154 in San Fernando, Pampanga by Cecilio Hilario; Majestad No. 155 in Bacolor, Pampanga by Francisco Joven; Dampulan No. 156 in Jaen, Nueva Ecija by Arturo Dancel; Bathala No. 157 in Ermita, Manila by Ambrosio Flores; Walana No. 158 in Calle Trozo, Tondo, Manila by Ambrosio Flores; Taliba No. 165 in Trozo, Tondo, Manila by Jose Dizon; Dalisay No. 177 in Santa Cruz, Manila by Sixto Celis; Lusong No. 185 in Tondo, Manila by Timoteo Paez and Paulino Zamora. As the situation deteriorated, Lodge Balagtas and Lusong reported the matter to Marcelo del Pilar in Spain and gave him power of attorney to take up all Masonic affairs of their lodges before the Grande Oriente Español. At the same time, a move was launched to question the authority of Nilad on its despotic manner of conducting lodge affairs and to eliminate Pedro Serrano Laktaw whom they blamed for all the troubles. Numerous charges and counter charges were exchanged and reports made, about the ill feelings existing between Nilad and the rest of the lodges. The need for a better organization was demanded. The lodges, on their own initiative, held a meeting in the house of Pedro Camus, Worshipful Master of Labong Lodge, in Malabon in March 1893 to discuss the creation of a central national body elected by lodges with powers emanating from the governed. They discussed the creation of either a Regional Grand Council or a Regional Grand Lodge whichever fitted best to their needs and in accordance with existing rules and regulations of the General Statutes of the Order. Apolinario Mabini, Ambrosio Flores, Abelardo Cuesta and Numeriano Adriano were elected directors of the movement. On March 25, 1893 Nilad Lodge, apprised of the movement, convened an assembly of members of the lodges. At this assembly, Lodge Nilad, the Mother Lodge lost the support of the other Lodges. Another assembly was announced by Faustino Villaruel of Lodge Walana to convene at his house on No. 8, Calle Asuncion in Binondo, Manila on April 16, 1893, in order to decide on the appropriate central body in accordance with the Statutes of the Grande Oriente Español. The agenda also included the issue of whether Laktaw would be allowed to continue working with the brethren, and to deliberate on the authority of Nilad over other Lodges. Lodge Nilad, upon receiving the invitation cancelled the assembly, declaring it unconstitutional, and warned the officers who signed the communication, of their responsibility which “carried in itself the source of rebellion against the Constitution of the Grande Oriente Español and the authority conferred on its Deputy, the Mother Lodge.” Nilad also declared the suspension of the signatories from their Masonic rights and ipso-facto brought to trial. The warning was ignored and Villaruel proceeded to preside in the assembly. Lodges Walana, Balagtas, Bathala, Taliba, Dalisay and Lusong were represented by their officers. Apolinario Mabini made a convincing presentation of the remedy to the situation by justifying the creation of a Regional Grand Council or the Gran Consejo Regional. After a thorough deliberation, it was decided to file an application with the Grand Council of the Order for the organization of the Regional Grand Council. Ambrosio Flores, Numeriano Adriano and Apolinario Mabini were elected to form a commission to draft the internal regulations of the Regional Grand Council. A cablegram was sent to Grand Master Morayta, followed by a letter from Villaruel on April 20, 1893 but, to their dismay, Joaquin Ruiz, Grand Secretary of the Order, acting on the protest of Lodge Nilad, sent a reply dated July 19, 1893 annulling the Regional Grand Council. Marcelo del Pilar’s office in Madrid was swamped with letters from Flores, Adriano and others, refuting the words of Nilad and Ruiz. Mabini’s letter on September 18, 1893 subtly warned of severing “all ties with Ruiz, who seems to personify the Grande Oriente Español.” Del Pilar brought the case directly to Grand Master Morayta who subsequently granted the demand and a charter was received. On December 10, 1893, the Gran Consejo Regional de Filipinas was installed. For his efforts, Marcelo del Pilar earned for him the title of Father of Philippine Masonry. Rizal’s stature and popularity and his explosive novels Noli Me Tangere and El Filibustersimo had tremendous impact among Filipino Masons, that when he arrived on June 26, 1892, Lodges like Balagtas and Bathala openly tendered banquets and parties in his honor. This fueled more suspicions among the friars and when Rizal immediately organized La Liga Filipina, a patriotic and civic organization largely composed of Masons, it was not unlikely that it was the main reason for his arrest and deportation to Dapitan. By 1896, the Spanish government had totally banned Masonry, and with the revolution that followed, all lodges ceased their labors. Masons who were members of the Liga Filipina would later suffer the fate of Rizal who was executed on December 30, 1896. Faustino Villaruel of Lodge Walana, Moises Salvador of Solidaridad (Madrid) and Lodge Balagtas, Domingo Franco and Numeriano Adriano of Lodge Nilad, along with others who became known as the 13 Martyrs of Bagumbayan were executed a few days after his death. Many leading Filipino Masons who survived the waves of persecution took to arms and joined the 1896 revolution. Marcelo del Pilar was instrumental in establishing Filipino Masonry in the country and the approval by the Grande Oriente Español of the first national organization of Filipino Masons, the Gran Consejo Regional de Filipinas in 1893. He is considered the Father of True Philippine Masonry. Five lodges were organized in the Philippines shortly after its founding: Los Girondinos No. 23, Integridad Nacional Nr. 35, Union No. 39, Patria Nr. 41 and Cosmopolita No. 117. It also established higher bodies namely: Elegido de Nueve Nr. 21, Caballeros de Rosa Cruz Nr. 18, Real Arco No. 20, and Camara del 30 (Progresso) No. 7.